By ordering today through this special trial promotion, you will receive one bottle of Beyond Biotics, a 14-day supply, for free. You pay only $9.95 to cover shipping and processing. All new customers will also receive a one-week supply of Grown American Superfood and the "Doctor's Guide" booklet at no additional charge. If you don't call to cancel within 30 days, you'll be billed for the additional 2-month supply of Beyond Biotics included with your initial delivery at the preferred customer discount price of just $39.95 per mo. ($79.90 total), plus $9.95 s&p. By ordering today, Therabotanics will lock in your discount as long as you continue on the program. You will receive a FRESH two-month supply of Beyond Biotics in 75 days (following your initial 2½ month supply), and then every 60 days thereafter, at the same low price of $39.95 per bottle, plus $9.95 S&P, guaranteeing that you will always have the freshest probiotics possible. There is no obligation to continue and you can stay on the program as long as you want and cancel at any time by emailing customer service at customerservice@beyondbiotics.com or calling 1-800-206-0772. 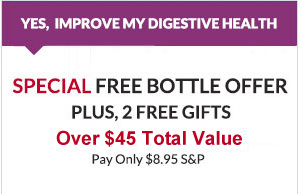 Offer Details: By ordering today through this special trial promotion, you will receive one bottle of Beyond Biotics, a 14-day supply, for free. You pay only $9.95 to cover shipping and processing. 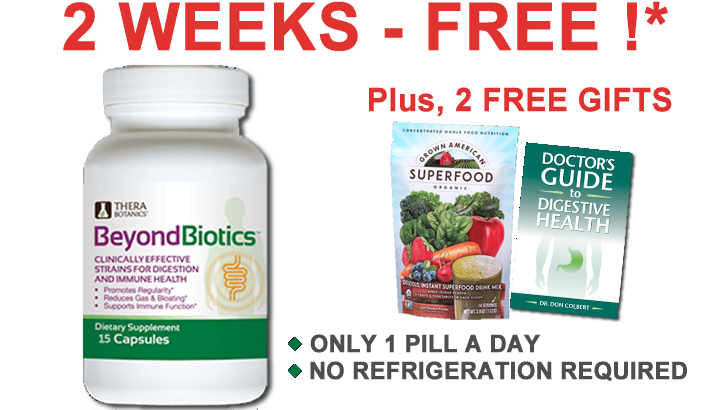 All new customers will also receive a one-week supply of Grown American Superfood and the "Doctor's Guide" booklet at no additional charge. If you don't call to cancel within 30 days, you'll be billed for the additional 2-month supply of Beyond Biotics included with your initial delivery at the preferred customer discount price of just $39.95 per mo. ($79.90 total), plus $9.95 s&p. By ordering today, Therabotanics will lock in your discount as long as you continue on the program. You will receive a FRESH two-month supply of Beyond Biotics in 75 days (following your initial 2½ month supply), and then every 60 days thereafter, at the same low price of $39.95 per bottle, plus $9.95 S&P, guaranteeing that you will always have the freshest probiotics possible. There is no obligation to continue and you can stay on the program as long as you want and cancel at any time by emailing customer service at customerservice@beyondbiotics.com or calling 1-800-206-0772. Super delicious superfood powder to help get your daily servings of fruits and vegetables. Each scoop contains over 30 American-grown organic superfood fruits and vegetables. Filled with valuable tips and answers to all of your digestive health questions. **Beyond Biotics™ is not equivalent to drugs or surgery. Always consult your doctor about any serious medical issues. If, within 30 days of receiving Beyond Biotics, you are not thrilled with your results, simply call customer service at (800) 206-0772 to cancel your order and return the unused portion for a complete refund of your purchase price (less shipping and processing).